Seriously. How Much does it Cost to Own a Racehorse? The truth is, it does not cost $20,000 a month to own a racehorse. However, it does cost around $45,000 a year to maintain a racehorse in training (in Southern California) and we will gladly break down the numbers for you. Supplies – Bandages, Tack, etc. Trainers claim they do not make any money from their day rate and any income is earned from their cut (10%) of the horse’s earnings. I’m not sure this is 100% true but, I am sure the trainers are not getting rich from their day rate either. Chances are your horse will not be in training at the racetrack 365 days a year. These horses are not machines and, like professional athletes, will need a break from time to time. When a horse is sent to a farm for a little R&R, the farm’s day rate is generally around $25 a day. Step 2: But Wait, There's More! If you are a member of a horse racing partnership you may be charged for accounting costs as well. Some racing syndicates may also charge monthly management fees. Entry Fees: Most people are surprised to find out that it does not cost anything to enter your horse in a race, unless the race is a stakes race (Kentucky Derby, Breeders’ Cup, etc.). Some stakes races, like many of the Breeders’ Cup races, cost in upwards of $50,000 to enter. Since the purse of that race is $2,000,0000, many owners will take their chances with the hope of a jackpot payoff. For stakes races in the $200,000 purse range, the entry fee is generally around $3,000. Trainer & Jockey Commissions: These are not necessarily fees so much as bonuses taken out of a winning purse. In general, the trainer and jockey receive 10% each of any winning purse and 5% and 5% for 2nd and 3rd place finishes. It's smart to keep this information handy when creating your horse racing business plan so there are no suprises when the winning purse shows up with these deductions. Accounting: Many horse racing partnerships, like Little Red Feather Racing, will charge accounting fees and end-of-year K1 preparation fees. As an individual horse owner, you must account (pun intended) for the time it takes to pay all of your monthly bills and keep records for tax purposes. Our suggestion is to simply hire an account who is familiar with the racing game to assist you. 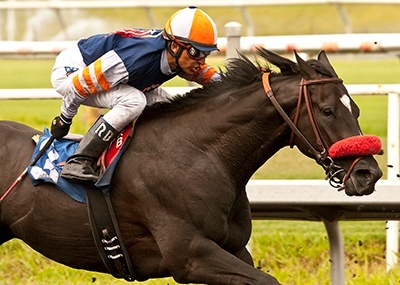 So how much does it really cost to own a thoroughbred racehorse? Let's make the assumption your horse will spend ten months (around 300 days) at the racetrack with your trainer and two months (60 days) on the farm. Using averages of the costs listed above, it should cost around $45,000 a year to train and maintain a race horse (in Southern California), excluding possible entry fees and accounting fees. Interested in finding out more about horse racing partnerships? Please contact Little Red Feather today or download our eBook below.